My friend, Jennifer, got me started with Lilla Rose Flexi Clips. I absolutely love them, as I can pull my hair back, look reasonably put together... and they don't fall out or tug at my head. And they released the July Flexi Clip early. I must have this one in a Mini size, for Trina to wear with her American Heritage Girls uniform. Because it is perfect. Is that just adorable, or what? That one is a butterfly, which she wears a lot. She also owns a dragonfly mini. 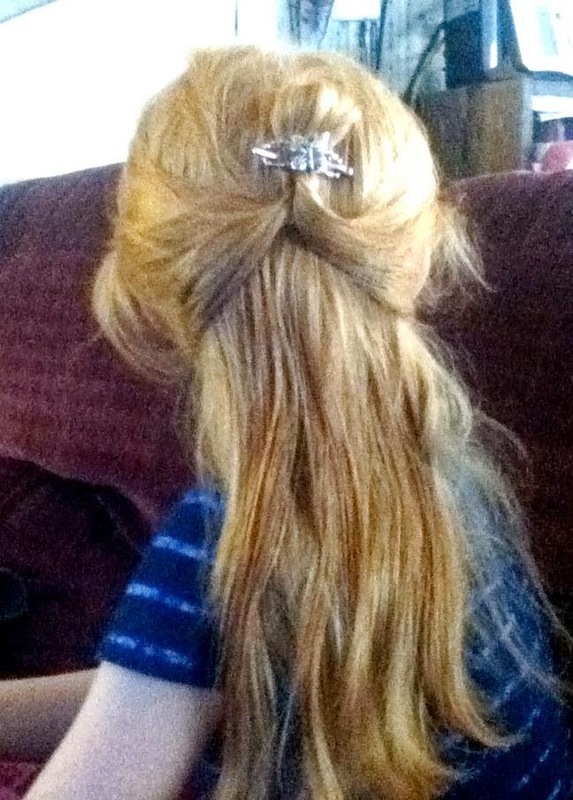 I do stuff like that with my hair using an Extra Small clip. We also use that size if we are trying to put up all of her hair. I use a Small to pull up all of my hair. Definitely watch the sizing videos if you are new to Lilla Rose! Love, love, love their products... and if you buy, I'd love it if you supported Jennifer. Thank you so much for sharing this! Her hair looks cute in a half up. Those clips are SO pretty!